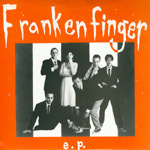 Actually, looking at this stack I've got here, I appear to have at least two Frankenfinger 7"'s. At some point, maybe I'll explain why I have as many singles as I do with no knowledge of what exactly comprises the collection, but today is not the day. Fortunately, I put the B-Side on first. Hmmmm.... what have we here. This is very strange, and not at all what I was expecting. Very odd story about getting a butterknife and doing nothing with it, though the narrator puts herself in the position to maim her mother, brother, and beloved kitty cat. This is pretty funny! And fun to listen to! Kinda like that "Pocketful of Sugar" song from that Godco album, only with a homicidal instead of lesbian subtext. I like it! Bah. The A-Side is pretty lame. "Freezerhead" is about exactly what you would expect (as long as you were expecting a song about someone with a freezer for a head). I'm not even going to finish listening to "Zodiac Killer." But "Butterknife" rocks. I'll listen to another one of their singles. Maybe today.